Let’s be clear: One full star of that four-star rating you see is for Humperdoo’s soft-shoe. 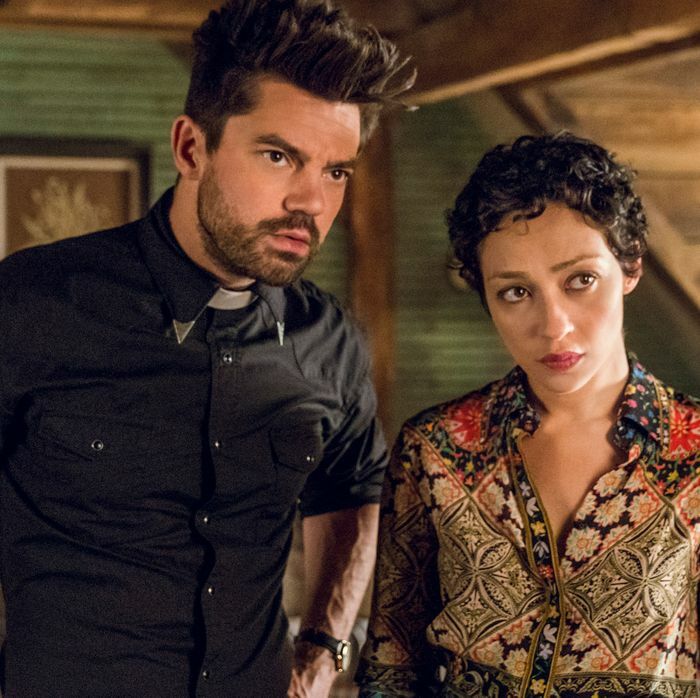 On the whole, Preacher is a delightfully demented show, but there’s something particularly funny about the sequences focusing on the Grail. Most of that comes down to Pip Torrens as Herr Starr. Though Starr certainly ventures into the kind of vulgar territory that Preacher thrives in, Torrens’s delivery is so dry (and, at points, camp) that, when left to his own machinations rather than put in the center of Jesse Custer’s drama, it almost feels like he’s on his own show. But before we get to The Herr Starr Power Hour, let’s take stock of exactly why the descendant of Christ is soft-shoeing to begin with. This week gives us our first glance at the morbidly obese, Mr. Creosote–adjacent Allfather (Jonny Coyne), who calls Starr via FaceTime (or whatever the Preacher equivalent of it is) to check in on how Humperdoo is doing. (For those of you wondering about the Allfather’s health, no, his stomach stapes are not holding.) When Starr expresses his reservations, the Allfather demands a demonstration of Humperdoo’s skills. As it turns out, Humperdoo has mastered one thing — the soft shoe — though, as Starr notes, in one of the episode’s funniest line deliveries, it’s not exactly relevant. But the Allfather finds it amusing, and far from punishing Starr for failing to turn Humperdoo into Mr. Smooth, tells him to speed things up. Of course, Starr can’t have that, which means that his plan of letting Jesse stew under Gran’ma’s care is going to have to change. In the interests of gaining a little leverage, he sets off to catch Cassidy, who is now tooling around New Orleans. After a disastrous date matched by a vampire dating app (it’s more a fetish thing than anything else, as becomes obvious when the girl he meets puts in a set of fake fangs), Cassidy is sitting at a bar, rendered immobile by a self-administered cocktail of alcohol and horse tranquilizers. That makes it easy enough for the Grail to grab him and begin recording a hostage video message — that is, until they’re ambushed by a group of mysterious figures, nabbing Cassidy right out from under them. This is the second big introduction of the week: Cassidy’s abductors are Les Enfants du Sang. For anyone familiar with the comics, you’ll recall this name being given to the group of vampire enthusiasts following a local vampire, Eccarius. Needless to say, it’s not an encounter that bodes well for poor Cass. It’s also another hitch in the road in getting Jesse the heck out of Angelville. Things have rapidly gone south with Cassidy’s escape, as Jesse and Tulip are quickly apprehended for having helped him go. Though they put up a fight (which begins with T.C. coming in, improbably, through the ceiling, and includes a round of what he refers to as “found object bathroom weaponry”), Tulip ends up chained to a radiator, and Jesse is deposited in a coffin at the bottom of the swamp. The fantasy is helping him to survive, sure, but that’s all he’s doing, and it’s not long before the cowboy manifestation of his conscience starts arguing that he should probably start trying to get back to Tulip. The bandit bodies are starting to pile up in a nearly comical way, and, as the cowboy says, “Real heroes don’t wait.” So the next time the train comes, Jesse stands his ground, and wakes up. Concurrently, Tulip is also doing her best to escape, with the intention of putting an end to Gran’ma. Unfortunately, she’s being watched by Jody, who, despite settling in with a crossword puzzle, seems to have a supernatural sense for each of her escape attempts. Downstairs, T.C. and Gran’ma are starting to cook up ways of punishing Tulip for letting Cassidy escape. Gran’ma already knows what she wants — Tulip’s soul — but T.C. manages to stay her hand for a little while, noting that Jesse would never forgive her, and suggesting that they do something else for a little while. That something else turns out to be a bit of roleplay, with Gran’ma playing the southern belle and T.C. an errant military captain, but it’s a fantasy that fizzles out when T.C. forgets his lines. Tulip’s soul it is. But when T.C. goes to collect Tulip, she’s managed to use a bit of sleight of hand to chain Jody to the radiator instead (not that that stops him for long, human tank that he is). She knocks T.C. out, and heads downstairs to confront Gran’ma. Though Gran’ma puts up a frighteningly good fight (Betty Buckley’s still got it), Tulip gets the upper hand, and chokes her to death. But as soon as the deed is done and Jesse comes running back into the house (having freed himself by sending a burning cigarette up through the coffin’s oxygen tube and blowing the whole thing up), Tulip collapses, just as dead as Gran’ma. We should probably have expected that getting rid of Gran’ma wouldn’t be so easy. If you recall, Gran’ma ate a mixture of Tulip’s hair and fingernails during her resurrection. That wasn’t to help bring her back — it was to tie Tulip’s life to hers, so as to guarantee that Jesse couldn’t and wouldn’t try to kill her. It takes a boost of adrenaline to restart Gran’ma’s heart and bring both her and Tulip back, but it leaves her severely weakened. Gran’ma needs to eat, and not just T.C.’s swamp consommé. She needs a soul. • There’s also a great Grail moment as Featherstone says she has an idea, and then pauses in the way that characters generally do before the scene cuts to commercial. Unfortunately, it doesn’t, and we’re left with Starr snapping at her to get a move on.